Our names are Justin and Rachel, and we are the OER Liaison librarians at University Library If you're new to Open Education Resources (OER) this guide will help explain what OERs are and where to find them. Please take a look at the section titled General Resources. You may also might find resources specific to your school or discipline listed under your IUPUI school. University Library can help see what resources are available. Below my image you'll see an Email Me button. Send me an email and attach your syllabus. I'll review the syllabus and let you know if there any comparable OER resources. How did I become involved in OERs? 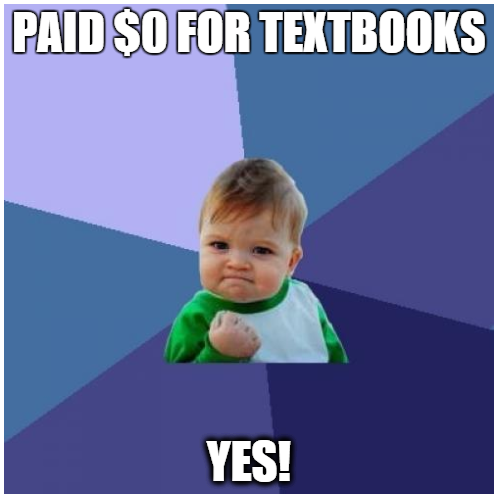 I first became aware of the often debilitating cost of textbooks as an undergraduate student; however, it was only when I first taught full-time as a college professor, that I realized how big of an impact the cost of textbooks can have on student success. In my classes, students might not purchase the textbook because their student aid had not arrived in time for the semester or because they couldn’t afford the cost of all their books. This left them to decide which texts were the most important. I found that the students who did not purchase the book had less comprehension of the material and, as a result, often received lower grades. It was because of these observations in the classroom that I first explored open-educational resources and became a proponent of their use. The cost of textbooks and learning material is a barrier to success. As my esteemed colleague, Jere Odell, recently noted, IUPUI students currently pay an average of $1,204.00 for books and supplies per year. That’s an annual investment of $26 million by students and families on course materials. This is a staggering statistic that is especially detrimental to under-resourced students. And, utilizing OERs is one of the easiest ways to help create equitable access and student participation in the classroom. While research on OERs is still in its infancy, recent studies have indicated that OER adoption contributes to improved course grades and withdrawal rates (which subsequently impact time-to-degree). Along with the overall reduction of per-semester costs that results from OER use, these factors point to the possibility of better retention rates for students using OERs as their primary textbooks. These elements also particularly benefit under-resourced students, for whom contingencies associated with cost, course performance, and time-to-degree can mean the difference between staying in college or dropping out. This guide has many authors. Thank you to Adriana Poo, Linda Crotty, Ann Agee, Christina Mune, Cory Laurence, Markita Dawson, Marva Tomer, and Michelle Chimento.